Libya Update: What’s Really Behind the Airport Firefight? Continuing from my OpEd of the 11th January entitled “Libya Update: Power Struggles Continue – Will the UN Get its Way?“, dramatic further evidence of my assessment came in the form of reports of intense fighting that started over the weekend and dramatically escalated this Monday, in the Libyan capital, Tripoli, leaving over twenty dead and over 60 wounded and the airport closed in flames. For two years UN diplomats have struggled to make something of the government they created — the Government of National Accord (GNA) — a creature that was supposed to unite Libya and bring peace to a shattered nation. Instead GNA officials spent Monday huddled in their Tripoli naval base, powerless while militias hammered each other in fighting around the city centre and specifically within Mitiga airport. There is a jail within that vicinity in the airport grounds run by a militia called RADA. They hold ISIS & al-Qaeda members amongst others. The people attacking are trying to get these extremists broken out of jail. That about sums it up. Several civilian passenger aircraft reportedly received bullet holes to their fuselage whilst parked on the runway. Certainly Air Afriqiyah Airbuses were damaged. Afriqiyah Airways actually announced that all five of its planes were damaged including, their new cargo plane. 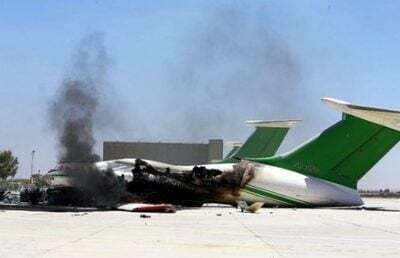 Buraq Air said two of its newest planes are damaged, and Libyan Wings suspended flights till further notice due to their damaged planes. Passengers are forced to try going south to an airport near Sabah – Temenhint Airport – or to take flights from Misrata or Djerba, getting there by road. All hours away by car from Tripoli. Mitiga airport has been the only functioning airport in Tripoli since July 2014, when Tripoli International Airport was destroyed by rival militias fighting for control of the airport. The GNA was “created” by the UN in December 2015, in Morocco in a place called Skirhat, when the so called LPA document was signed, and has been in Tripoli, as the internationally recognised government since March 2016. That is enough time, one might think, to get a grip on at least the capital. And yet on Monday night social media was full of claims that GNA prime minister Fayez Sarraj had been spirited to safety by Italian forces, to another safe haven secured in Tripoli and even rumoured to have fled to Tunisia, because he is so unpopular. There is no Libyan security force he can count on. Every few months Tripoli’s militias erupt in a spasm of violence in their battles to control prime real estate in the Libyan capital, heedless of pleading and visits from UN and other diplomats for peace. The irony is that the one peaceful part of Libya is the east, which has its own government and a single army, commanded by Field Marshall Khalifa Haftar. The East of Libya also has the majority of the Country’s oil. The UN choice of prime minister for its puppet government called the GNA, Fayez Serraj, has remained very quiet while paid militias attack the Airport. This is prime evidence of a total lack of leadership and complete impotency. Perhaps that is why he was installed by the UN: to be a puppet for certain countries’ agenda.This farce and interference by the UN has to end before the country further tears itself apart. That time seems to be drawing closer than it was thought. This article was originally published by Ron Paul Institute for Peace and Prosperity.